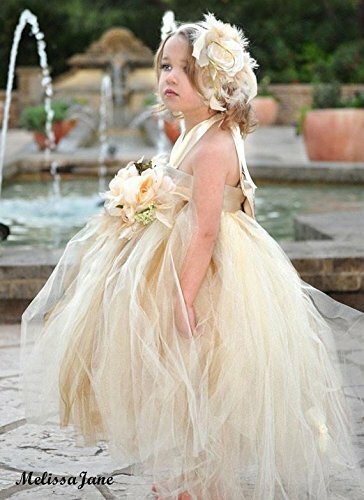 Beautiful Tutu Dress, made with love and care, this tutu has the best quality shimmer material that is made in the USA, over 200 yards used, also attached/sewed it a tutu slip so the tutu is not see though. A large Satin Bow attached to satin bodice, with soft little bows down the back....with beautiful top quality flowers that are made on a detachable brooch. The tutu was made shorter in the front and long at the back to give the fairy tail look. Small 0 - 18 months approx 17" waist and 12" in length Medium 2 - 4 years 19" waist and 19" in Length Large 4 - 6 years 20" waist and 24" in length Extra length 28"